Disclaimer: I don't own the Real Ghostbusters. Only Carlton and Julianna Stantz and all other OC characters. The guys pulled up to King's Restaurant where the owner, Mr. Fredrickson, approached the four men looking very scared and upset. “Don’t worry, sir,” Ray told him, “We’ll have the ghost out of there in no time!” He had a big smile on his face. Catching ghosts was Ray's main idea of fun. The guys went into the restaurant and started to look for the ghost. They then decided to split up so they could find the ghost more quickly. “Ray, you take the kitchen, Winston the back room, Egon the front room and I’ll take the rest rooms!” Peter ordered. Ray went down to the kitchen holding his PKE meter in his hand. He then heard a loud noise coming from the kitchen and saw the ghost throwing things and generally being nuisance. “Ah ha!” he yelled, “I got you now! Guys, help!” He chased after the ghost. The others heard Ray’s yell and they came over to help him. “Let’s get that little gooper! Yahoo!” he yelled. The guys went after the ghost. It took a good while to catch him because he insisted on playing around and hurling various objects at them. Peter threw the trap under him and finally the ghost was sucked in. “Finally, he’s trapped! I don’t wanna see him again.” Winston said while wrinkling his nose. “Yes, I concur, Winston,” Egon agreed. With the ghost trapped, they headed out of the restaurant. Mr. Fredrickson thanked the guys for a job well done and paid them. After checking with Janine to make sure that they didn’t have any more calls to attend to, the guys set on their way back to the Firehouse and were soon chatting with one another. “I was thinkin’ for this Thanksgiving, instead of having the dinner at the Firehouse, d’you all want to come over to my place?” Ray asked. "Yeah, sure. That sounds great." Winston smiled. "We'd love to." Peter and Egon also nodded their heads in agreement. The guys were looking forward to having Thanksgiving at Ray's place. "What's Elaine going to cook this year?" Peter asked. "Well, she's gonna cook the turkey of course. Also instead of ham she decided to cook chicken. Green beans, dressing with cranberry sauce, mashed potatoes, too," Ray explained as he steered Ecto round a corner. "She's lookin' to have you all come over and her parents are gonna be over our house, too." "That sounds good." Winston replied. "I just hope Slimer doesn't get stuck into the food before we do." "He won't. I already warned him," Ray told him. "Yeah...if he does, I swear I'll blast him," Peter said, remembering the previous year, when Slimer ate the turkey before the guys could have any. "Don't worry, Pete," Ray assured him. "We'll keep Slimer out of there." He pulled Ecto into the Firehouse and everyone got out. Slimer floated down when he heard the guys coming back and he, as always, greeted Peter first. "Hiya, Peter!" he squealed as he gave him a slimy hug. "Slimer!" Peter yelled while grabbing his proton rifle. "I'm going to get you!" 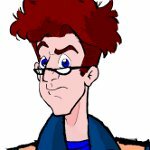 Egon was going down to put the ghost in the containment unit while Winston said to Ray, "You wanna help stop Pete from blasting Slimer?" Ray smiled in agreement, "This never stops does it?" A little while later, Ray was driving home from the Firehouse. He had had a long day busting ghosts and other supernatural oddities and he was a little tired. He couldn't wait to get home and relax after what seemed to be an even longer day of ghostbusting than usual. 'I'm almost home. I'm going to lay down and relax,' he thought to himself as he smiled. Pretty soon, Ray pulled into his driveway. He stepped out of his car and went inside. He walked in and saw Elaine cooking the food for thanksgiving. He went over and gave her a kiss. "Hey, sweetie. How are you doing?" he asked. "I'm good, Ray," she replied. "I took the day off of work and spent the day cleaning the house to get it ready for when Mom and Dad arrive in the morning, so it will be clean and spotless. That's what I did most of the day, then a little later, I went out to the grocery store to pick up some pies and a cake, and a few items I needed. How was your day?" "I"m a little tired. We had a couple of busts that took up most of the day. I feel like going up to bed early but I'll help with the food and whatever else you need," he said. "Thanks, Ray," Elaine said, gratefully accepting the extra help. Ray and Elaine headed to the kitchen to finish up with the food and do a little more cleaning up around the house for the next day. The kids, CJ and Jules, were upstairs cleaning up the guest bedroom for their grandparents to sleep in. CJ vacummed the carpet while Jules was making up the bed. They made sure that the bedroom was clean and nothing was left out of place. After everything was clean and set up, everyone decided to go to bed, as they had an early rise in the morning for Thanksgiving. "I think this is gonna to be the best Thanksgiving ever," Ray smiled as he was getting his pyjamas on. "Yeah, me too, Ray," Elaine smiled in agreement. "My parents are going to be with us, which is great. Did you invite the guys and Aunt Lois over?" "Yep. I warned Slimer to stay out and away from the food when they come over," Ray answered. "Good. I'm glad," Elaine said. "I like Slimer as much as you do. I don't want him to get into the food." Ray nodded his head in agreement, understanding his wife's concern. "Come on, let's go to sleep," Ray said, "We're gonna have a good day tommorrow. Goodnight, Elaine." "Good night, Ray," Elaine said before giving Ray a good night kiss. The next morning was Thanksgiving. The Stantz family woke up and got ready for their guests' arrival. Ray went down to the train station to pick up Elaine's parents, Sam and Dolly Furman, who had arrived from Morrisville. While he was doing that, he decided to pick up his Aunt Lois so she wouldn't have to spend the holiday all by herself. Elaine and the kids made sure that everything was ready by the time the guests arrived. Elaine warmed up the food in the over so it could be nice and hot by the time they were ready to eat. The kids did some last minute cleaning up and fed Lucky, Fluffy, PW and Princess, the cats. So they wouldn't be in the way while the guests were there. The doorbell rang. Moments later, Ray entered with Sam and Dolly and his Aunt Lois. "Hi everyone, we're here!" Dolly called. CJ and Jules were the first ones to greet their grandparents and Aunt Lois. "How are you doing, Grandma?" Jules asked giving her grandma a hug first, and then she greeted Aunt Lois. Dolly smiled at her, "I'm doing real good, sweetie. The ride on the train didn't last as long as we expected." CJ was already talking to his grandpa about how he is doing in basketball, since he played for the school team. "It's really fun, even though sometimes we do lose some games, but mostly we work hard and have fun," CJ told him. "That sounds real nice, CJ," Sam smiled at him. "Do you want to show me a few shots in the back yard?" "Yes." CJ said he and Sam were going out the door to do a few shots in the backyard. Elaine came out of the kitchen after setting the food out, she greeted her parents and Aunt Lois. "Hi Mom," she said while hugging the both of them at the same time. "Hey Elaine. How's everything been going for you and Ray?" Dolly asked. "Very well," She replied. "Where's Dad at?" Dolly answered, "He went out to the backyard so he can watch CJ do a few shots with the basketball hoop." Meanwhile Ray sniffed the air, "Mmmm, that food sure smells great, Elaine. I can't wait to get some of that turkey," he grinned. "Not yet," Elaine reminded playfully slapping his arm, "Let's wait until everyone's here." The doorbell then rang and Ray went to answer it. It was Winston, Peter, Egon, Janine and Slimer. Ray greeted them, "Happy Thanksgiving, guys." "Happy Thanksgiving, Ray," Winston greeted as the guys and Slimer entered the house. "It smells really good in here," Peter sniffed the air, his mouth was watering in anticipation of good food. "Thanks. It's almost time to eat. Come on, everyone's in the living room," Ray said, showing them the way as they hung up their coats in the closet. "Hey everyone, the guys are here," Ray called. Everyone greeted them and Ray introduced Elaine's parents to Janine and Slimer. Everyone was talking among each other while Slimer was about to go into the kitchen to look for the food. But one look from Janine... "Slimer, don't you dare!" she warned. The tense warning made the spud back off right away. Soon, Elaine told everyone to wash their hands and come to the table. Everyone was now sitting at the table, waiting to start eating. Soon after grace was said everyone started eating. Everyone was enjoying the good food and chatting with one another. "Well, this is awesome! I'm very thankful for my friends and my lovely wife, Elaine, my in-laws, Sam and Dolly, Aunt Lois and my two wonderful kids, CJ and Jules." Ray smiled in gratitude. "You've all stuck by me even in the bad times...That's what I'm thankful for." "ThaT's true," Peter agreed, "I'm thankful for having friends, yep, even the spud too, when he's not bugging me." He gave Slimer a wink. "Really?" Slimer grinned as he gave Peter a slimy hug and a kiss that caused everyone to start laughing. "You're alright most of the time," Peter answered. He had decided to take sliming in his stride. It was the holiday, after all. After dinner was finished, everyone placed their plates in the dishwasher. For now, the guys and CJ decided to watch the football game on TV while the ladies and Jules were having a girl talk before having dessert. A little while later, it was dessert time. The pies and cakes were set out so everyone had a few choices on what they wanted. After dessert was eaten, everyone was full and decided to play some games. Everyone really enjoyed themselves on this Thanksgiving and they were planning to have it over at Ray's again next year. I intentionally waited until today to read this; it's been a rough time lately. Farah, so many of your stories are filled with sweetness and love, and this is no exception. thank you so much. It's a thanksgiving treat for everyone to read.